Obama Mocks Trump ‘Doom And Gloom’ Speech. Then YET ANOTHER MASS TERROR ATTACK Proves He Should Be IMPEACHED. Remember when Obama made the intellectually stupid and frankly morally idiotic claim that Islamic State was “JayVee” and then tried to weasel out of his own utterly stupid remark??? He’s done that a few times. He just did it again. ‘This vision of violence and chaos everywhere, doesn’t really jibe with the experience of most people,’ the president says. President Barack Obama on Friday strongly denounced the dark and dire terms in which Donald Trump and the Republican Party described the condition of the United States after nearly eight years of his presidency. Obama has shown a greater willingness to directly attack Trump, and has done so with gusto. After Trump whipped up terrorism fears in the wake of the Orlando massacre and suggested Obama was sympathetic to attackers, the president delivered a withering takedown of the billionaire, saying he “will not” let Trump’s vision for the future take hold. Obama took a different tack as he hit the trail with Hillary Clinton, relishing the chance to mock Trump for his tweeting, saying his daughter Sasha can tweet, too — that doesn’t meant she should be commander in chief. We can go back and look at the horrifying picture Barack Hussein Obama painted of George W. Bush’s presidency. Because Obama told us if we elected John McCain the entire world would melt due to global warming and financial ruin and terrorism and pretty much everything else. But keep in mind that Barack Obama is a demon-possessed hypocrite liar and that it’s only fascist when the OTHER side does what he routinely does in demonizing the other side’s vision and track record. I remember when Bush gave an incredibly opaque reference that Democrats took to be an attack against Obama, and they came unglued. It didn’t matter if Obama was demonizing Bush over Iraq, over Afghanistan, over his war on terror, over our debt, over the economy, over gas prices, over damn year everything under the sun. Oh, and Obama was just a butthurt victim and there was no way he would ever do anything so horrible. Obama gets to demonize because he is filled with demons, but nobody should get to ever demonize him or they are racist or worse. And yet I have seen Obama attack Trump directly by name in virtually every continent on planet earth by now. Today he scheduled a media event with the president of Mexico the day after Trump’s RNC speech to demonize Trump by name. Because if you are a Democrat, you are the worst form of disgusting hypocrite vermin who ever lived. But let’s get back to the essence of Obama’s attack against Trump: that Trump says we’re in dark times and Obama says everything is blissful in his perfect Utopia. To someone who is NOT a fool, this looks pretty damn dark and pretty damn dire. And it is now beyond obvious that we will NEVER be able to deal with this dark and dire reality of terrorism unless and until we elect a president who holds a diametrically opposite worldview to the failed Democrat Party’s current chump-in-chief. Keep in mind these statistics run to 2014-2015. 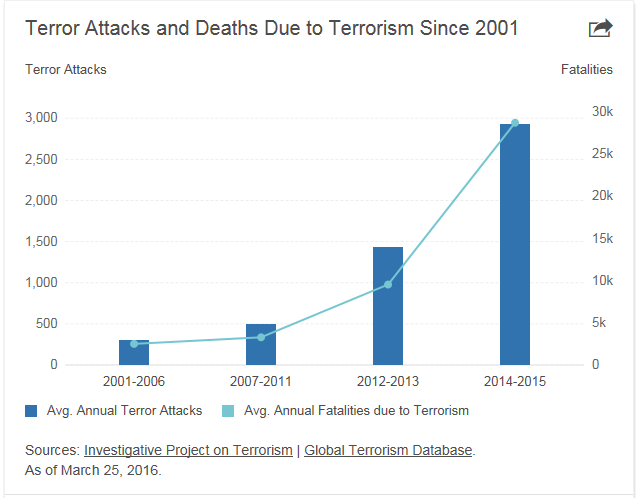 Have you heard about any terrorist attacks in 2016? Oh, YEAH. And since this is blocked in terms of two year periods, and since it has a clear trend of doubling under Obama, you tell me if I’m wrong to conclude that they will EASILY get to 60,000 deaths a year caused by terrorist attacks by that next period of 2016-2017. When Obama took office, we were dealing with about 3,000 deaths caused by terrorism a year. 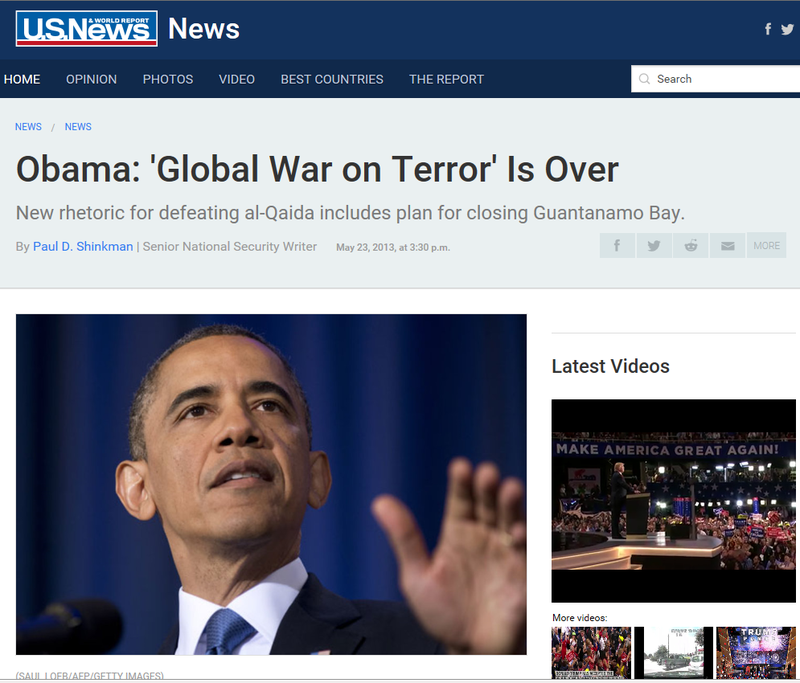 By the time Obama leaves, it will be at least 60,000 terrorist murders a year. Just do the damn math: 1,900 percent increase. And as of 2014-2015, terrorist attacks had already skyrocketed from about 500 a year to 3,000 a year, a 500 percent increase that will very likely also double to 1,000 percent by the time Obama leaves office. Which is to say that we have vastly more attacks which are each becoming more and more successful. But these are a “dark” fact and it’s not fun to think about truth when it reveals the truth about Obama and his massive failures. Yesterday, I had a meeting with my city’s police chief to coordinate with him on an event that my church is planning. Driving into the police station, I noticed the flag was at half staff. Because under this failed presidency, the flag is nearly ALWAYS at half-staff. Barack Obama is the half-staff presidency. His entire presidency is a time of mourning and distress for our nation as we have an unending series of terrorist attacks against our civilians and a now unending series of terrorist attacks by Democrat activists against our police. Multiple deaths are reported in a shooting at the Olympia shopping mall in Munich, Germany. Police confirmed that shots have been fired in the mall but gave no information on casualties. There are conflicting reports on casualties. According to the local Muencher Abendzeitung, up to 15 people have been killed in the center, while German NTV channel puts the death toll at 10. There are reports of further shooting at Karlsplatz square in central Munich, but this has not been confirmed by police. Taxi drivers have been advised to avoid the Karlsplatz area. Police believe there are “several” shooters, die Welt reports. Multiple deaths at the shopping mall have been confirmed by police, Reuters reports. Shots can be heard in a video posted by a witness on Twitter. We learn when we follow the time line that this happened right about 1 pm EDT, and Obama was blathering his lies at 12:43, just minutes before. HEY, OBAMA, YOU WICKED FOOL, THE BIRDS ARE NOT CHIRPING IN GERMANY RIGHT NOW. And if they are in swimming pools, they are floating face-down by now. And now over an hour later we are hearing that there are MORE attacks going on as I write this. It aint over yet. And again, just as Obama and Hillary Clinton want here, Germany took away all the guns from all the decent citizens. But terrorists don’t give a flying damn about stupid progressive liberal gun laws; in fact they REJOICE in them and praise Allah for them; because their helpless targets are guaranteed to be unarmed like the apathetic and pathetic sheep they voted themselves to become. Last year (2015) there were 151 deaths caused by terrorism in Europe. The year before that it was FOUR. And many of those attacks last year and now continuing this year were carried out by Muslims who came in through “refugee” status, or who came in as immigrants. And Obama wants to explode that same status HERE in America so we can have an even BIGGER explosion of terrorist deaths. Obama wants tens of thousands of these people; Hillary wants that figure to be increased by a factor of 500%. Our FBI says we cannot possibly vet these Muslims Obama and Hillary demand to be brought in (because Muslims overwhelmingly vote Democrat and Democrats are just that cynical and that depraved that they don’t CARE how many Americans are murdered as long as they get their votes). Obama’s own senior national security advisers say we can’t vet these people. But that’s just reality. And who gives a damn about reality??? Certainly not you, if you voted for Obama or plan to vote for Hillary Clinton. Obama and reality have nothing to do with one another. In fact, they hate each other very deeply. No one has ever hated reality more than Obama; and reality has never taken such an intense disgust of a human being as it has to Obama. If Barack Obama says it, and at this point it almost doesn’t matter what it is he says, it is a LIE. You get into a vicious bar fight and then just decide to quit fighting and put your arms down. I’ll call 911 for you. But that is EXACTLY what Obama did and has been doing since 2009 when he first pulled out of Iraq against the wisdom of every single one of his generals and then issued a “red line” that he refused to uphold in Syria. And on and on. Obama ought to be arrested for crimes against humanity for failing to deal with this explosion of violence that he has in America pimped into a war against our Constitution and our 2nd Amendment; he ought to be convicted, and he ought to be locked up in GITMO and waterboarded until he reveals which of our enemies he has been the puppet of. If times are dark, we desperately need a president who will acknowledge that we are in dark times and that he will lead us out of them. Because there is and can be nothing worse than following a man who led us directly IN to that dark time all the while CRIMINALLY refusing to acknowledge that we are in one. We have cancer, but Obama says we’re fine, nothing wrong. We really desperately need a chemo treatment, surgery, radiation, whatever it takes to kill the disease, but Obama says that is ridiculous and the sugar pill will give you energy and you can run around for a while like nothing happened. At least Donald Trump is acknowledging the world and acknowledging America as it really is. Because of Barack Obama and his toxic worldview, we have the worst race relations in fifty years. Crime has skyrocketed out of control and our police are literally being assassinated in increasingly frequent attacks because Barack Obama and his wicked regime criminalized the police and depicted black people as victims of police death squads – as the Black Lives Matter movement that chanted “What do we want? DEAD COPS! When do we want it? NOW!” that Barack Obama has invited over to the White House maintain. And terrorism has exploded beyond anything that the human race has ever seen because of our fool in chief. And Hillary Clinton wants to double down on wickedstupid. There is only ONE candidate for president who is pointing out the truth that you are worse than a fool not to see at this point. And that candidate is the man who Barack Hussein Obama just demonstrated himself to be a FOOL by mocking when HE is the worst fool who ever lived.